The International Dairy Federation (IDF) has been shaping the environment in which dairy operates and driving the sector forward for well over a hundred years, said IDF President Dr Judith Bryans. 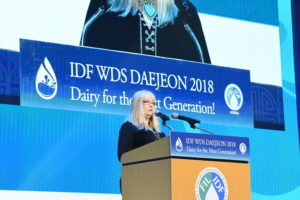 Dr Bryans said one of IDF’s strengths is the unique way it works with its 41-member countries, allowing the organization which represents 75% of global milk supply to speak with true global consensus. When IDF speaks, she said it does so with the voice of the global dairy sector. “We will continue to shape the future operating environment for dairy and hope you will support us in our work,” said Dr Bryans. She commended the Korean team for its organisation of the Summit and bringing the world of dairy to Korea to exchange knowledge on Dairy for the Next Generation.